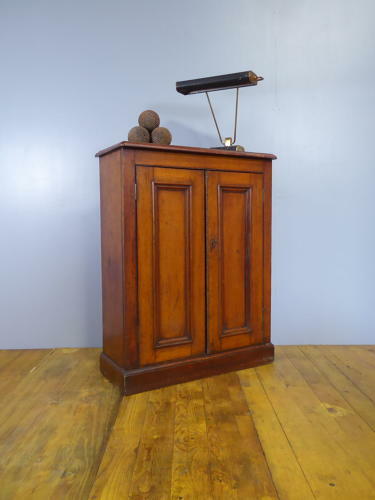 A fantastic antique golden oak school cabinet. A beautiful piece of old school furniture, super quality & unusually thick solid oak throughout which has built up a wonderful, rich golden colour over the years. The twin panelled doors open to reveal a shelved interior, the shelves are removable & the brackets spaced at regular intervals. A timeless & very useful piece of industrial furniture. Wear commensurate with age & use, clean & ready to use showing numerous signs of age, unrestored. The cabinet is over 100 years old & shows numerous signs of age consistent wth it's past, the right hand door probably had a strim running down the front originaly which is long since lost & the key does operate the lock but needs attention to function properly (the door does stay closed). Collection preffered, UK courier service a possibility, please enquire for details.